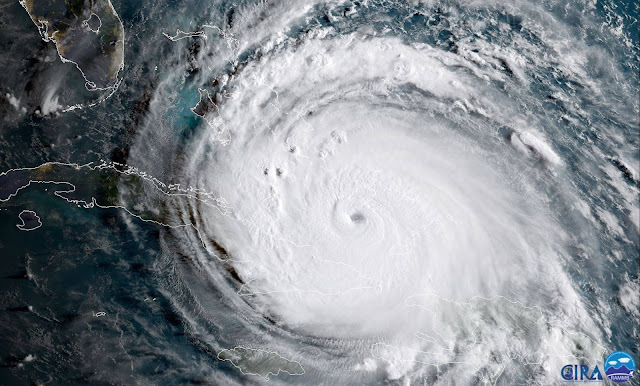 The NOAA-NASA satellite GOES-16 captured this geocolor image of Hurricane Irma passing the eastern end of Cuba at about 8:00 a.m. EDT on Sept. 8, 2017. Forecasters say the eye of Irma should move near the north coast of Cuba and the central Bahamas on Friday, Sept. 8 and Saturday, Sept. 9, and be near the Florida Keys and the southern Florida Peninsula Sunday morning. Irma, now a category 4 storm, has maximum sustained winds near 155 mph with higher gusts as of 2 p.m. EDT on Sept. 8. Some fluctuations in intensity are likely during the next day or two, but Irma is forecast to remain a powerful category 4 hurricane as it approaches Florida. Created by NOAA's partners at the Cooperative Institute for Research in the Atmosphere, the experimental geocolor imagery enhancement shown here displays geostationary satellite data in different ways depending on whether it is day or night. This image, captured as daylight moves into the area, offers a blend of both, with nighttime features on the left side of the image and daytime on the right. In nighttime imagery, liquid water clouds appear in shades of blue, ice clouds are grayish-white, water looks black, and land appears gray. (The city lights are a static background created with VIIRS Day/Night Band imagery. It does not show any existing power outages.) In daytime imagery, land and shallow-water features appear as they do in true-color imagery.